This tip applies to Windows 10 (Fall Creators Update(version 1709), April 2018 (version 1803) and newer. Back in the day there was a program called PC Decrapifier. It is a freeware program you could use to rid a new computer of all the junk that computer manufacturers load on new computers trying to monetize and make more money. That was then and this is now. Windows 10 has a feature called Fresh start that allows you to remove the manufacturer’s pre-installed bloatware and trialware. It comes with all versions of Windows 10 and you don’t have download any 3rd-party programs . Start fresh with a clean and up-to-date installation of Windows. Microsoft recommends that you back up your files before making changes like a clean installation of Windows to your device. 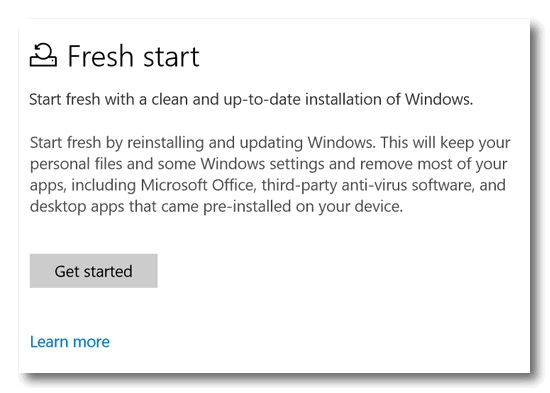 Fresh start will remove all apps that don’t come standard with Windows, including other Microsoft apps such as Office, third-party antivirus software, and desktop apps that came pre-installed on your device. It will also remove all other Windows Desktop apps installed by your device’s manufacturer, such as your manufacturer’s apps, support apps, and drivers. It will keep only Microsoft Store apps installed by your manufacturer. You will not be able to recover removed apps and you will need to manually reinstall these apps later if you want to keep using them. Make sure that you have access to all reinstallation media (such as CDs), product keys, license or login information, or other materials needed to manually reinstall and reactivate the apps or app-related content you want to keep using. You may lose your digital licenses, digital content associated with apps, or other digital entitlements for apps, which may impact your ability to use apps or app-related content you paid for. If you just purchased a new device that includes Office 365, please see Download and install Office 365 Home, Personal, or University on your PC for information about reinstalling Microsoft Office after the clean installation of Windows. If you have Office 2010 or earlier, you will need to locate your Office product key. For tips on locating your product key, check Find your Office 2010 product key or enter the product key for your Office 2007 program. Almost always, when a brand new computer is slower than it should be, it’s because the manufacturer has loaded it down with bloatware and bloated limited-time trials security applications – particularly McAfee or Norton. So, if you have a new computer and it seems slower than it should, the first thing you should do is run Fresh start. You can run a Windows 10 Reset or Fresh start. Windows 10 Reset gives you the option to save all your personal files and reinstall Windows or remove everything and reinstall Windows. 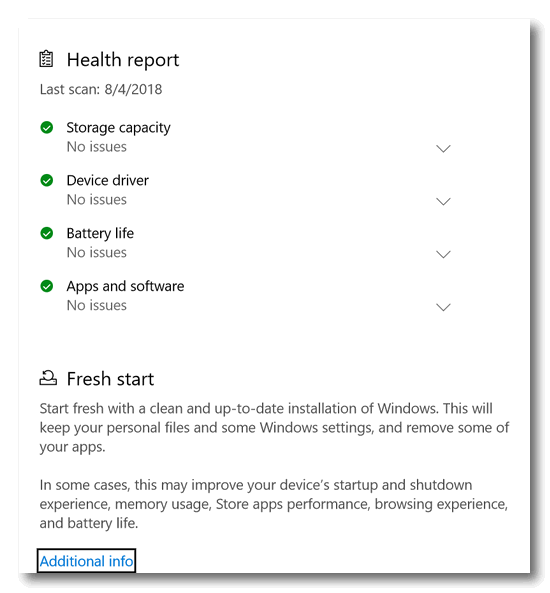 Fresh start will clean install a fresh, updated version of Windows 10 and keep all your personal files and some settings.